The European Commission has taken Garuda Airlines and three other Indonesian carriers off its aviation blacklist, citing safety improvements. 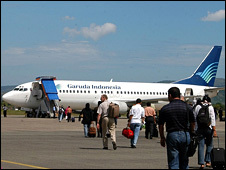 The EU banned all Indonesia-based jets from its airspace in July 2007, after a series of air crashes in Indonesia. The Yemeni airline, Yemenia, is not on the new list, despite safety concerns raised after one of its aircraft crashed last month, killing 152 people. Many of the airlines blacklisted by the EU are African or Central Asian. A Commission statement said "significant improvements and accomplishments of the Indonesian civil aviation authority are recognised in the area of safety". Apart from Garuda, the ban was lifted on Airfast Indonesia, Mandala Airlines and Premiair. The statement also said TAAG Angola Airlines could now operate again into Portugal "only with certain aircraft and under very strict conditions". EU Transport Commissioner Antonio Tajani repeated his call for an international blacklist of airlines deemed to be unsafe. He first proposed such a list after it emerged that the Yemenia jet that crashed off the Comoros had previously given EU inspectors cause for concern. "It is high time that the international community rethinks its safety policy; those airlines which are unsafe should not be allowed to fly anywhere," he said in a statement. "We should gradually move towards an international strategy based on co-operation between countries around the world."